Rob Kardashian is said to have moved into Blac Chyna home but just for the sake of their daughter, Dream Kardashian. According to TMZ, their sources revealed to them that Rob moved in last week and that Blac Chyna's neighbours are not happy with the development as they referred to them as 'riff-raffs'. TMZ also reports that Rob Kardashian is not back with Blac Chyna. He is only there to see his daughter. Rob and Blac Chyna are back together which for some is good news, but not for their neighbours, who are asking cops for advice on what they say has become a dangerous situation. We've learned the on-again, off-again couple is back under Blac Chyna's roof in her gated San Fernando Valley neighbourhood. We're told Rob moved in late last week. 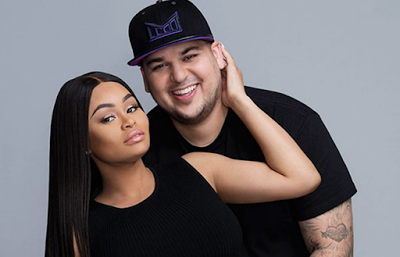 Law enforcement sources tell us cops were in the gated community Tuesday for an unrelated matter when several neighbours flagged them down and ticked off a laundry list of complaints against Rob and Chyna. Among them ... they said there were "thugs" visiting their home, who did not go through the front gate but rather jumped the wall, avoiding security. The neighbors called them "riffraff." The complaints go on ... Rob parks his car on the front lawn because Chyna has a fleet of cars that take up the proper space. The neighbors also say the noise is unbearable, at all hours. Our sources say cops told them there's nothing they could do but they should take it up with the homeowner's association. But cops said the house is now on their radar. The neighbors said the community is filled with "affluent people" ... lawyers, athletes and actors and they told cops they were worried Rob and Chyna would bring property values down Sources close to the situation tell us the two are NOT together ... Rob was only at Chyna's to see his daughter. We're told Rob's been focusing on his health and being a good father.